The thyroid is a butterfly-shaped gland which is present on the base of the neck that makes hormones that regulate the metabolism. Metabolism is the process by which our body utilises the energy for various activities like the rate at which the body uses fats and carbohydrates, control body temperature and help in the production of essential proteins. Hypothyroid is a health condition that occurs when the thyroid gland does not produce enough hormones. The hormones produced by thyroid gland are triiodothyronine (T3) and tetraiodothyronine (T4). The lack of this hormone scan produces some ill effects on the body as it upsets the normal balance of chemical reactions in the body. More is the deficiency of the hormone, the higher the severity of the symptoms. The symptoms of hypothyroidism can go unnoticed initially because it can be as simple as fatigue or weight gain. Over a period, as the metabolism tends to become slower, the signs and symptoms become more apparent. Advanced hypothyroidism leads to a condition called myxedema which is rare but can become life-threatening. The symptoms of myxedema are low blood pressure, decreased breathing and body temperature, unresponsiveness which can ultimately lead to coma or death. Although this condition is most common in middle-aged and older women, infants who are born without a thyroid gland suffer from congenital hypothyroidism. They have symptoms of jaundice, constipation, sizeable protruding tongue, puffy face and frequent choking. If left untreated, it can lead to severe intellectual and physical disabilities. Some young children and teens can also suffer from hypothyroidism and can experience poor growth, delayed puberty and mental growth. Autoimmune disease- An autoimmune disease is a condition in which the immune system of an individual starts attacking its cells. At times, the cells of the thyroid gland can be attacked by the immune system. Hashimoto’s thyroiditis is one such condition that has hypothyroidism as its primary symptom. Thyroid surgery and radiation therapy- If a part or the whole of the thyroid gland is removed, then it can halt the thyroid production. Similarly, radiation used to treat head and neck cancer can lead to hypothyroidism. Certain medications– Some of the medicines like lithium used to treat psychiatric disorders can cause hypothyroidism. Treatments for hyperthyroidism- Patients of hyperthyroidism are treated with radioactive iodine to normalise the thyroid function. In some cases, this can result in permanent hypothyroidism. Pituitary disorder- Pituitary gland is a pea-sized gland which is present in the brain and controls the activity of the thyroid gland by producing stimulating thyroid hormone. A benign tumour of the thyroid gland can cause hypothyroidism. Pregnancy– Few women are affected by hypothyroidism during or after pregnancy as they produce antibodies against their thyroid gland. It can lead to miscarriages, preeclampsia and also change the development of the foetus if left untreated. The process of diagnosis of hypothyroidism includes blood tests and regular screening. Known for its anti-inflammatory properties, curcumin acts on pro-inflammatory enzymes like COX and LOX, thus controlling inflammation and providing natural relief from thyroid disorders. 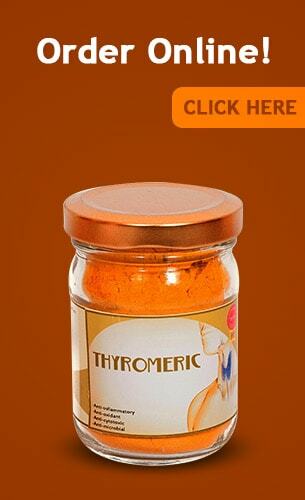 Curcumin has been found to be an effective antioxidant in hypothyroidism. 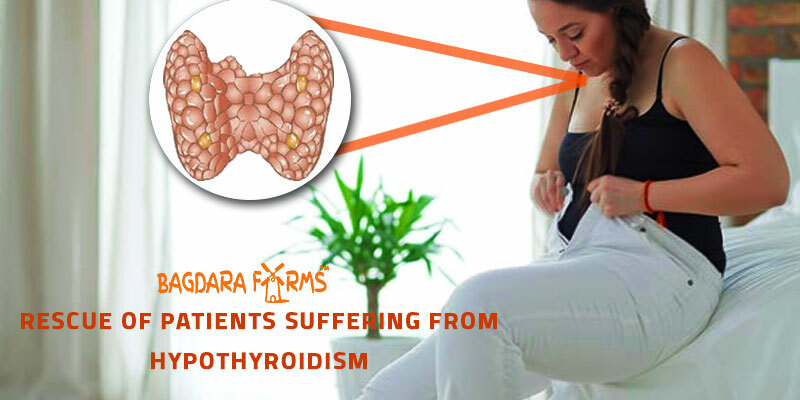 Many studies have also shown that curcumin and turmerone can stimulate the production of thyroid hormones which benefits the patients of hypothyroidism, especially the younger ones. Hypothyroidism can also be caused due to certain autoimmune conditions as mentioned above. Curcumin has excellent immunomodulatory action and prevents the occurrence of Hashimoto’s disease that can cause hypothyroidism. Turmerone and curcumin sensitise the thyroid gland cells to the action of radioactive iodine used in the treatment of hypothyroidism. Mix ½ tsp Thyromeric, ½ tsp lemon juice and a cup of boiling water. Add honey to taste and take it twice a day. Take hot water, ½ tsp Thyromeric, ¼ tsp black pepper, ¼ tsp virgin coconut oil and mix all of them well. Drink this twice daily. Take a small saucepan and add ½ tsp Thyromeric, ½ tsp ginger, ½ lemon juice, black pepper and 1 ½ cups of water. Boil all the ingredients for a few minutes and strain it. Add honey to taste and drink it twice a day. Buy Thyromeric and Treat Hypothyroid Naturally. I am on medication for hypothyroidism 125mcg, will i need to leave my medication or need to take along with it? Can thyromeric cure thyroid problem permanently or need to continue alike medicine? For how many months is this dosage? Pls let me know , it will help me to purchase this product. Thank you so much, mam, for your query! We shall surely help you, firstly you would be required to do your thyroid test before you start with Thyromeric and gradually decrease your medicine dose. Also, mam, we have seen our customers for whom their thyroid levels have improved significantly and they are off their medicines for a lifetime. You need to take this for 3-4 months. Mam, if you can share your number, our experts will call and explain you. I recently began gaining weight rapidly even though I am not doing anything different as compared to before. I have also noticed that my hands and feet are forever cold. I am not certain as yet if this is a result of a thyroid disorder, but since I have a family history of hypothyroidism I am afraid that I too am going down that road. I want to try some natural remedies that can stop my descent into this lifelong problem. Will curcumin give me fast and effective results? Rapid and unusual weight gain and cold extremities are two of the most common signs of hypothyroidism. If you begin consuming curcumin regularly right away you may gain from its multiple therapeutic effects. Firstly, the anti-inflammatory nature of curcumin is very beneficial when it comes to reducing chronic inflammation resulting from a thyroid disorder. Additionally, since it is an antioxidant it reduces oxidative stress which heightens as a result of hypothyroidism. At a younger age, regular curcumin supplementation can help stimulate the production of thyroid hormones and reduces the intensity of hypothyroidism. Curcumin is perhaps one of the only natural elements that produce results quickly especially in case of thyroid disorders. If you start taking it right away, you may even be able to reverse your condition and prevent yourself from developing full-blown hypothyroidism. I would like to try this product please guide me about it.